Let's rewind all the way back to some afternoon in December, when my friend Ann and I were texting each other about a genius idea to plan a weekend getaway, adults only. 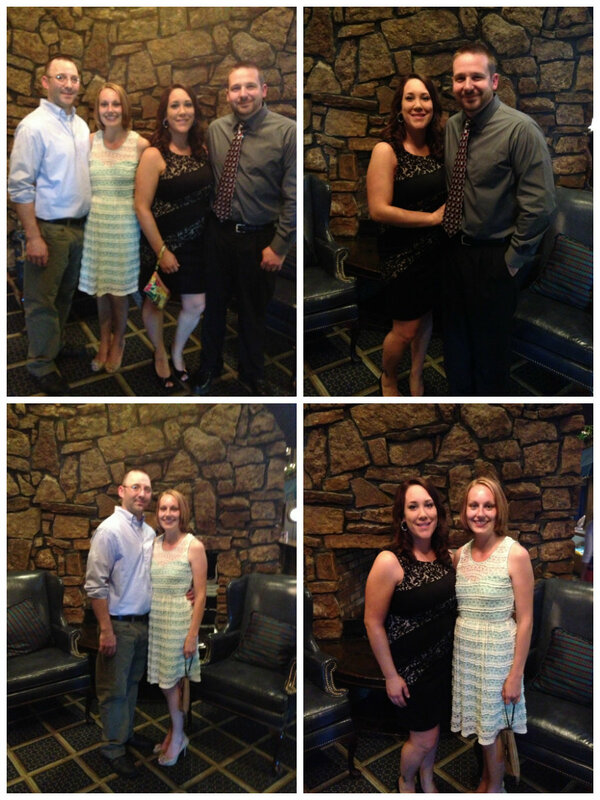 It started small--a night at the Chanhassen Dinner Theater. 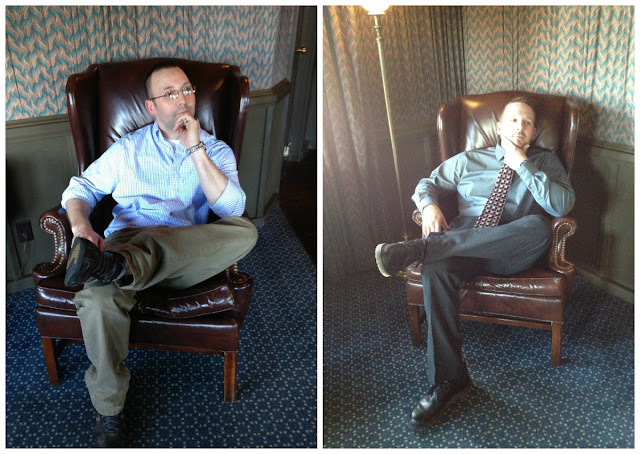 But then it grew and grew until we had the entire weekend planned, starting on lunch Friday through lunch Sunday. Then we had to wait and wait for this weekend in May to finally come. Now that it's come and gone, I am a bit sad it's over. We are definitely looking forward to our next weekend getaway in the near future. After dropping my boys off with Scharmer, a grandpa figure in their lives, we loaded up our stuff in our friends' van and began our journey to Chanhassen, Minnesota, a quaint, touristy town outside of the Twin Cities. We prettied ourselves up and walked the short distance from the hotel to the Chanhassen Dinner Theater (me hobbling a bit because I brilliantly decided I needed the biggest, skinniest heeled shoes when my feet are far more comfortable in flip flops), where we posed for a million pictures like the cheesy tourists we are. We were served dinner and drinks before the show by a new waiter, Jeremy, who started off nervous and tentative, but ended the night on a high note--a very high note, indeed. You see, we may have consumed too much red wine (of which we learned the correct pronunciation that night from our friendly waiter) and misread the bill, inadvertently (and stupidly) leaving lucky Jeremy with a very sizable tip. And I mean SIZABLE! The show's poster, stage, and dinner menu. Although the show itself didn't suit our interests and we all found it slightly odd, I would definitely consider Friday night the highlight of the trip. I guess we can blame it on the wine and the fact that we parents rarely have freedom and may have overindulged. Back at the hotel later that night, after ditching our fancy clothes for comfy pjs, we caught up on our daily squats and ended our night at a very late time--midnight, oh my! 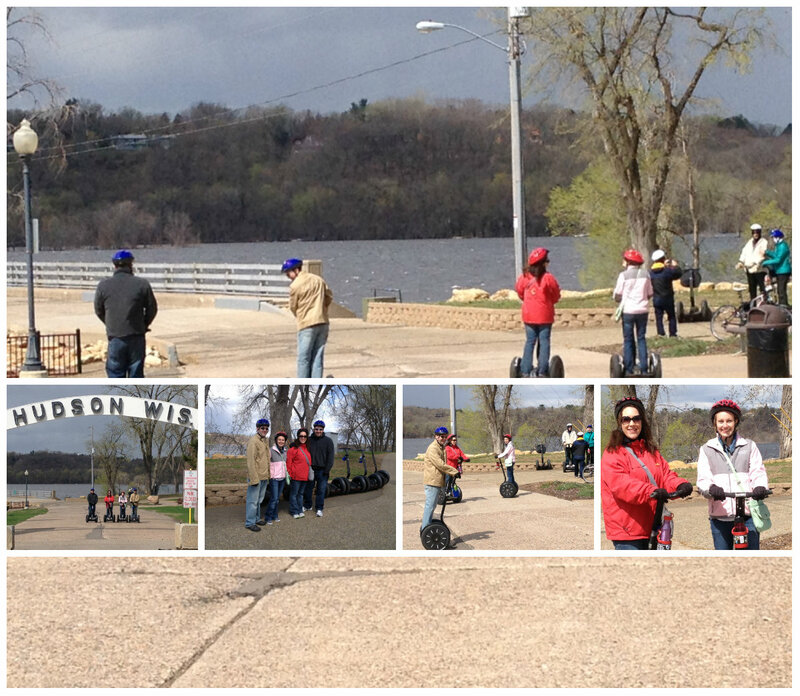 Saturday we drove a bit to Lakeland, Minnesota to go on a segway tour. Picture mall cops trafficking the halls of crowded malls; but instead of overweight middle aged men, imagine four eager parents garbed in the warmest clothing they packed (translation: freezing their butts off) and the $2 gardening gloves they hastily purchases from a hardware store by their hotel, and you'll get the picture of us on these goofy motorized vehicles. Segways are tricky little buggers. They are completely feet-driven. The handlebars are more for balance than steering. It took a bit of practice to learn how to maneauver these things--roll onto the tips of your toes to go forward, back on your heels to stop, lean your body to the side to turn--and I may have perhaps possibly skidded up over a curb and biffed it (gracefully, of course) before I completely understood the delicate intricacy of driving a segway. Practicing the complicated driving technique. 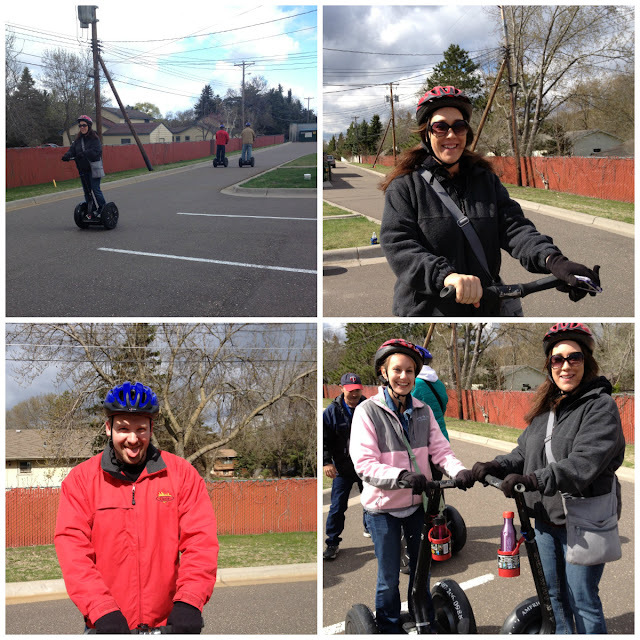 We happened to pick the coldest, windiest day of the whole weekend to go on the segway tour. Temperate: 47 degress (felt like 39). Wind: 30 mph. Brrrr! At one point it even sleeted on us, the tiny pebble-like precipitation pelting us in our wind-blown faces as we scooted 8 mph on the little vehicles. Pit stop at Hudson, WI. The tour consisted of driving through town, alongside a busy interstate, over the river and convening at the Hudson River for a little history lesson and a photo-op and to stretch our surprisingly sore feet and legs. Who knew segways were so strenuous to ride? Then we rode back. Saturday afternoon we dropped the men off at a brewery in Excelsior, Minnesota while the women enjoyed heavenly massages for a glorious 60 minutes, leaving us feeling relaxed, sleepy and a bit lazy. The men, on the other hand, were amped up and ready to start their retirement plans of opening their own brewery, in a corner of my garage, no less. 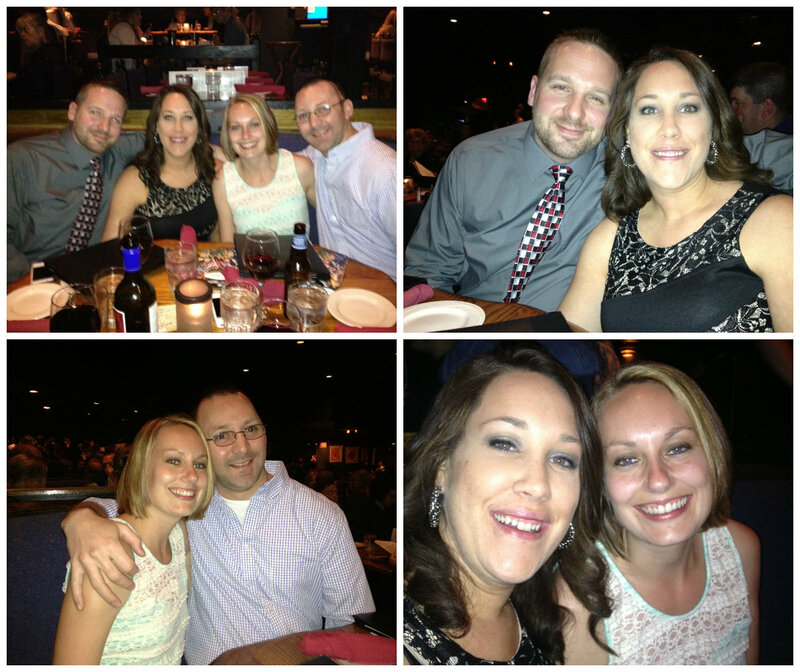 Our last night we prettied ourselves up again and headed to a fancy restaurant across the street from our hotel. A weekend of overindulging left us all feeling a bit bloated and tired, reminding us of our age and current lifestyle, so we enjoyed a quiet evening in comparison to our first night. Although I loved our weekend away with wonderful friends, I was definitely ready to be reunited with my children, and the feeling was mutual within the group. We barely talked about our kids the entire weekend, but Sunday our conversations kept steering back toward them again and again. It was time to go home. Our first weekend getaway was a success; now on to planning number two. HaHa!! I love the squats! !